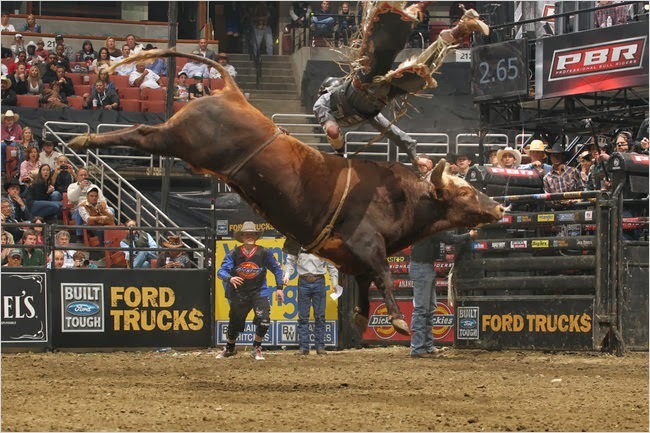 Professional bull rider Guilherme Marchi riding a bull named Betray Me. Image from rodeocountryradio.com. I just want to take a moment to share some photos from my night at the rodeo last weekend. These were taken at the PBR (Professional Bull Riders) LiftMaster Chute Out at Honda Center in Anaheim, California. Here's one that I took from our seats. Anaheim is in Orange County, which is far from where I live. But, you know. All for the love of the sport. Not the cowboys, no. That would be shallow. Those are some...shiny buckles. Ahem. Image from hauteliving.com. I am not fully aware of the ins and outs of bull riding, but I do know that it's equal parts thrilling and harrowing. 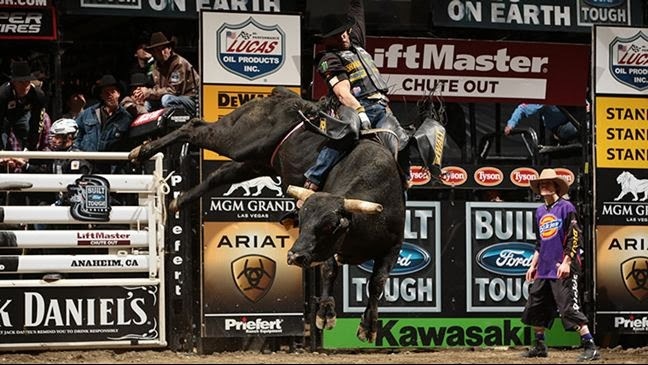 The biggest celebrity of the night was not a rider, but a bull named Bushwacker, a legendary beast who bucks off 96% of riders and is about to retire. Look at this. The legendary Bushwacker. Image from www.nytimes.com. I enjoyed myself up until the final ride of the night. Bushwacker threw a rider named Nathan Schaper and smashed his leg, breaking it. The arena went silent. Schaper was all right, but he had to be carried out of the ring on a stretcher. I hate that someone got seriously hurt, but I can't believe how thrilling it is to watch this. Thrilling also is my first guest blog at Delilah Devlin's today! I've included an excerpt, a contest, and a giveaway, so I'd love it if you could stop over and say hello. Delilah is the editor of the forthcoming Cleis Press anthology Cowboy Heat. I've got a story in the collection, which comes out this June.